FAYETTEVILLE, Ark. – Colten Jones, a sophomore in U of A’s Dale Bumpers College of Agricultural, Food and Life Sciences, will miss a few classes during the spring semester while he’s out of the country. He’s not studying abroad or conducting research, but the environmental, soil and water science major will be experiencing different environments. Enduring them, might be a better description. Jones, from Lake Ozark, Missouri, is one of the top mountain bikers in both the United States and in the world. He is currently ranked No. 14 in the country and No. 63 in the world in the Enduro Under 21 Division, and he’ll be competing in Enduro World Series events, and other races, during the spring. Endurance mountain biking is a one or two-day race and typically 20 to 40 miles. Each race has multiple stages and courses that are physically and technically challenging. The timed stages are mostly steep descents with occasional small amounts of climbing. Between each stage, though, a competitor climbs to the start of the next stage. While these between-stage transfers don’t count against race time, which is usually between 15 and 60 minutes, they do take energy out of riders and can cause a time penalty if not finished within a set time period. A single transfer can take up to three hours of non-stop climbing. 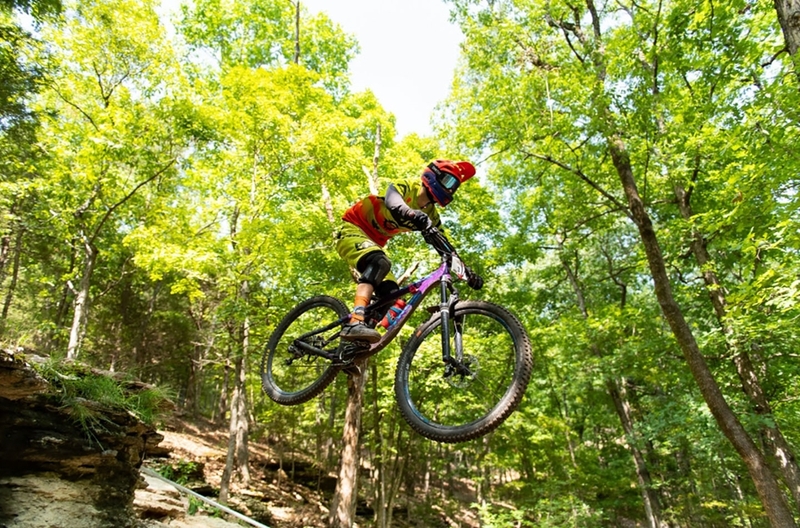 Jones competed in the O-Rock Epic Enduro at Big Cedar, Oklahoma, last April and finished second. In May, he competed in the Upper Buffalo Enduro at Red Star, Arkansas, and was second again. In August, he was 51st at the Big Mountain Enduro Aspen-Snowmass in Aspen, Colorado. These races earned him his current ranking. This spring’s Enduro World Series competition schedule includes the EWS Shimano Enduro in Derby, Tasmania, both in March; the MET EWS Val Di Fassa in Canazei, Italy, in June; and the EWS Northstar in Northstar, California in August. Jones’ family hopes to get him to some of those races, if possible, but he’s also planning on more races outside the EWS schedule. Most of his local training is at Mt. Kessler and Mt. Sequoyah in Fayetteville, and trails in Bentonville. He also schedules seven or eight-hour practice sessions on trails in Eureka Springs or through the Ouachita Mountains in Big Cedar, Oklahoma. Training also includes riding a road bike 30 to 100 miles three or four times a week in addition to strength training several times a week. Jones got into mountain biking as a sixth grader. In high school, Jones wrote papers on the environment and fell in love with the subject, which helped him choose his major. He also sees a correlation between his major and mountain biking. Jones chose the University of Arkansas in part because of the trail system and local mountain biking community – and the opportunity to get deeper into his environmental studies. His goals, as a first-time EWS qualifier this year, are to have fun and gain experience. But he’s also looking to the future. Richard Gasperotti heads to Ukraine for a mountain bike adventure.